The band won the season championship honors, ranking first amongst all grade three bands in the Eastern United States Pipe Band Association - and was promoted to grade two. The Monaghan Pipe Band won the grade three event at the Celtic Classic in Bethlehem, Pennsylvania. It was the first time the band won this invational event. This contest closes out the band's 2001 competition schedule. 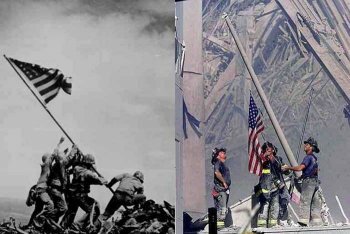 Despite being the darkest day in our nation's history, a glimmer of light burst through the clouds of fear and uncertainty. Bass Drummer Dan Hamilton's wife Danielle, gave birth to their son Phoenix - named after the mythical bird that rose from the ashes. Cnogratulations to the new parents. The Monaghan Pipe Band won the grade three event at the Capital District Scottish Games at the Altamont Fair Grounds on September 1, making the band the Grade Three Northeastern United States Pipe Band Champions. The games had the largest EUSPBA grade three event of the year, with a total of seven bands. In addition to the overall win, the band also won the "Best Drum Corps" prize. Congratulations to Pipe Major John Wassman, Lead Drummer Gordon Bell and all the pipers and drummers of the Monaghan Pipe Band. Special thanks to band alumnus Bob Costigan who came out of retirement to do his usual splendid job on the bass drum. This marks the last EUSPBA sanctioned contest the band will play at this season. The band had its strongest year in grade three - from start to finish - becoming "the" band to beat. In seven sanctioned contests, the band took six 1st places and one 2nd place. It was also a season that saw the band challenge up to compete against grade two bands on two occasions, and take a third at Roundhill and a second at Rockland. In addition to its "Northeastern" championship title, the band won the "EUSPBA Championship" title earlier this season with its win at the Colonial Highland Games. The band will continue to compete this month with an appearance at the Celtic Classic, a prestigious but non-sanctioned event held each year in Bethlehem, PA. The Monaghan Pipe Band won the Grade Three event at the Hunter Mountain Celtic Festival for the second year in a row. The band took a First and a Third in Piping and First in Drumming and Ensemble. The band also won First Place in Dress and Deportment. It was the fifth first prize the band took in six contests sanctioned by the Eastern United States Pipe Band Association. Congratulations for a job well done by Monaghan Piper Joe Brady, Jr. who served as the Director of Piping Events for the first time for the Hunter Mountain Celtic Festival. Joe also did his usual excellent job as the Drum Major of the continent's largest massed band which he leads down the mountain at the conclusion of the festivities each year. Congratulations as well to Monaghan Veteran Drummer Gregory F. McLaughlin who debuted, and did a great job, as the Master of Ceremonies. The Monaghan Pipe Band took fifth prize at the North American Championships on August 4th at the Glengarry Highland Games in Maxville, Ontario. It was the first time the band placed at this prestigious event. On the following day, the band took second prize at the Montreal Highland Games. Monaghan won another grade three contest, its fourth 1st place in five contests this season. This time it happened at the Rockland County AOH Feis in Stony Point, New York. Monaghan took straight firsts in piping, drumming and ensemble. Monaghan also challenged up to grade two and took a second place out of four bands in a very close contest. Gordon Bell won the Professional Drumming contest, Rich Janniello won the Grade Two Drumming, and Lachlan Cameron took a first and a second in the Grade Three Piping events. Congratulations to Michael Price of the 1st Highland Watch for winning the top prize in our annual raffle. Web Site of the Year! This web site has received �Web Site of the Year� honors from the Bagpipe Web Directory. 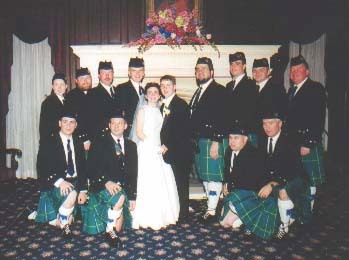 Previously honored by the directory as the �Web Site of the Week� for the first week of 2001, Monaghan�s Web Sites now holds a piece of the highest honor given to piping related sites on the internet. Click here to visit the Bagpipe Web Directory. The Monaghan Pipe Band received three awards this week, two for contest wins at the Roundhill Highland Games and one for being the best pipe band at the world's most prestigious and well known St. Patrick�s Day Parade. At the Roundhill Highland Games in Norwalk, Connecticut, the Monaghan Pipe Band won the grade three pipe band contest with sweeping results, obtaining first place rankings from all four judges. The band challenged grade two and won third place in that event. The band was particularly happy with taking seconds in drumming and ensemble in the grade two contest. Each year the band proudly marches the County Monaghan Society up Fifth Avenue on the feast day of Ireland�s patron saint. The band is proud to bring such recognition to the Society with this award. The Monaghan Pipe Band won the Grade III Eastern United States Pipe Band Championship with their victory at the Colonial Highland Games at Fairhill, Maryland. The victory was the band's second in a row in this young season. The band was presented with the Balnagowan Trophy, for winning the grade three event, and the Seaforth Trophy, for having the best drum corps. Bursting out of the gates for the 2001 competition season, The Monaghan Pipe Band won the grade three event at the Monmouth Highland Games. The band fielded its biggest competition unit ever, with fifteen pipers, five snare drummers, three tenors and a bass. In drumming solos, Richie Janniello won the Grade Two MSR. On April 7th, the EUSPBA's Metro Branch hosted a full day of workshops that included instruction from Monaghan Pipe Major John Wassman, Lead Drummer Gordon Bell, and other members of the Monaghan Pipe Band. The well-attended event included several other instructors and had a wide range of courses. Stay tuned for information on other upcoming workshops. Peter Duffy, long time Monaghan Piper, has announced his retirement from piping. Peter marched his last parade with the Monaghan Pipe Band this past St. Patrick's Day. His daughter, Annette Mohan, who has been a Monaghan Piper since 1977, is taking a leave of absence from the band. We hope to see her back shortly. 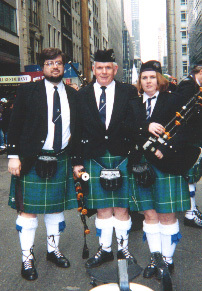 Peter (middle) is flanked by his son Martin and daughter Annette moments before he would step off for his last trip up Fifth Avenue this past St. Patrick's Day. Click here to visit our tribute to Pete, which includes a pictorial you won't want to miss. Welcome back to Monaghan Piper Kevin DiFiore! Kevin rejoined the band on St. Patrick's Day after being on sabbatical for the past year. Kevin first joined Monaghan in 1996, along with a powerhouse of players that include current members Lachlan Cameron, Eddie Cameron and Byrne O'Sullivan. Much thanks to sisters Linda O'Brien and Annette Mohan for all their photo contributions, which comprise the bulk of the old band pics. Thanks to a recent contribution, we have added on another band photo from 1979. Click the picture below to see it in full in the band photo section. Pipe Major John Wassman has completed his cabinet with the appointment of Peter Skae to the position of Pipe Sergeant. Peter, who started piping under Ed Larkin and was an original member of the Rockland County AOH Pipe Band, has been an open/professional piper since 1991. Peter furthered his piping skills under Joe Brady, Jr. and James Kerr, and is currently a student of James Stack. In addition to Rockland and Monaghan, Peter has also played with the Worcester Kiltie Pipe Band and the FBI Pipe Band. As pipe sergeant, Peter Skae serves as John Wassman�s right hand man in the pipe corps. He will help teach the pipers, tune the band and act as pipe major in the pipe major�s absence. The change in pipe sergeants becomes the third and final change among the �field� offices since the last competition season concluded. Such offices have to do with the musical leadership of the band, as opposed to the administrative leadership positions such as the band manager, treasurer and quartermaster. The first of these changes was the appointment of John Wassman as pipe major. Following that was the astonishing recruitment of Gordon Bell as the lead drummer. Now Peter Skae completes the team. The Monaghan Pipe Band Web Site - this one right here - has been recognized as The Bagpipe Web Directory Web Site of the Week for the week of January 5th, 2001. Bob Dunsire, of the Bagpipe Web Directory wrote the following review. "This Grade 3 band from NY has been nominated for WSOW by a number of loyal viewers. An attractive and interesting web site, here you'll find efficient use of frames, and a unique colour scheme that is both functional and visually appealing. Lots of information here (lots of NEWS), and an excellent use of photos. A successful, and long established band, a warm and friendly web site, and nearly every member can be reached by e-mail." Much thanks to our web master Valerie Duffy and to all who have contributed to this web site, including its loyal viewers. Visit the Bagpipe Web Directory by clicking the image below. Monaghan drummers Richie Janniello and Marianne Marcellino tied the knot on Saturday November 18th. Click here for some details and some picutures! The Eastern United States Pipe Band Association recently promoted three Monaghan Pipe Band members for the purposes of solo competition. Such upgrades reflect a strong standard of play, and are a credit to the performance and promise of these young players. Congratulations to Richard Janniello who was promoted from grade three solo drumming to grade two, Jared Brogan from grade four senior piping to grade three, and Thomas Munks from grade four junior piping to grade three. Rich, Jared and Tom are all moving up in the world. The Monaghan Pipe Band is pleased to announce that Drum Major Gordon Bell has joined our ranks and will be leading our drum corps. Gordon Bell has long been respected as one of the Premier drummers in the United States, and has been recognized as a world class drummer by the very best. Gordon was the corps leader for Parlin and District as they dominated the pipe band scene in the United States for over ten years, which included taking the band to Grade 1. He grew up as a student of Norman McLeod in the Kenmure Pipe Band, which was the predecessor of Parlin. Gordon has also played for the City of Washington Pipe Band and the 78th Fraser Highlanders. Gordon also lead the corps for Lehigh Valley. Gordon Bell was the EUSPBA Champion Supreme for open drumming from 1979 through 1987. He is an EUSPBA panel drumming judge and an instructor for the Balmoral School of Piping and Drumming. Martin Duffy now steps down from running the Monaghan Drum Corps. "It is an honor and a privilege to play for Gordon Bell" said Martin. "It is a great thing for Monaghan and it is also a good thing for pipe bands in general in that Gordon will once again be doing what he does best, which is putting out a quality drum corps. Pipe band drumming, as an art form, benefits from having one of its best artists teaching and performing." Corps veteran Gregory McLaughlin agrees. "You can count with the fingers on one hand those drummers in this country who even consider themselves on Gordon's level. He is one of the best drummers this country has ever produced." Gordon rejoins his long time friend John Wassman, who was his band mate at Parlin. John Wassman, Monaghan's new pipe major, is very excited over this addition. "Having Gordon in the back end changes the whole landscape of the band." Martin Duffy agrees. "We have grade one leadership. Some of our competitors in Grade 3 have made some powerful acquisitions of players themselves, but we can be nothing but pleased over what we now have. You don't play better then Gordon Bell. To go into the off-season and see both John Wassman and Gordon Bell come into the band is an absolute dream." Gordon comes from a piping and drumming family. His father George Bell is the former pipe major of Kenmure. Mr. Bell is a well-respected piping instructor and judge who has taught countless successful competitive pipers including Monaghan Pipe Major John Wassman. If you measure the success of his students, one would have to conclude that George Bell is the most successful piping instructor in the New York/New Jersey area. Mr. Bell hails from Scotland where he not only piped but was the lead drummer for a grade one band. Gordon's brothers Jimmy and Duncan are top of the line Pipers, each in their own right. Both are successful open soloists and EUSPBA panel piping judges. Jimmy Bell was the pipe major of Parlin and District, taking the band from Grade 2 to Grade 1, and is now reshaping the piping landscape of Florida. Duncan continues to be a major force in the NY/NJ area both as an open competitor and a member of the DelMar & District Pipe Band . Gordon's brother Donald is an open drummer who has played with Gordon in Parlin and and has played with City of Washington. Gordon's son Colin continues the drumming tradition as he brings his pipe band background to the arena of DCI - Drum Corps International. Older news can be found by clicking the arrow below.